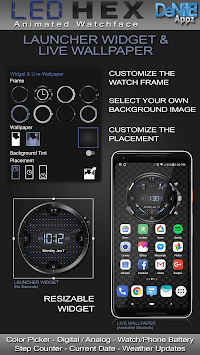 This completely customizable interactive HD Android Wear / Wear OS Watch Face, Clock Widget & Live Wallpaper brings a classic elegance to your wrist and Launcher. 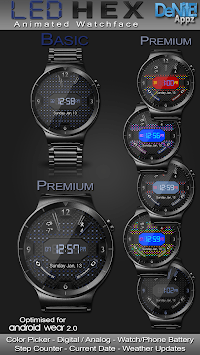 Features include custom complications, battery levels, weather conditions, step counter, color picker & date information. A settings app will also be installed on your mobile device to configure the watch face for any look you desire. Select any color and create a completely custom look for yourself! 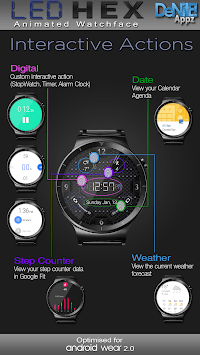 Don't have an Android Wear watch? No Problem! You can use the clock widget or Live Wallpaper on your launcher! 💡IMPORTANT - Not compatible with Samsung Smart Watches that use Tizen or smartwatches with other operating systems than Android Wear. Please also note that as this is an HD watch face, the file is a bit larger and can take up to 5 minutes to transfer to your watch. This is normal. Widget - Depending on what launcher you are using, you can either long press on your launcher to place a widget, or select this widget from the App Drawer -> Widgets list. Customize and change the widget settings with the accompanying App. If you have any problems at all, please send me an email before leaving a negative review - I will do my best to fix the issue as soon as possible. Stay tuned for more watch faces to come!